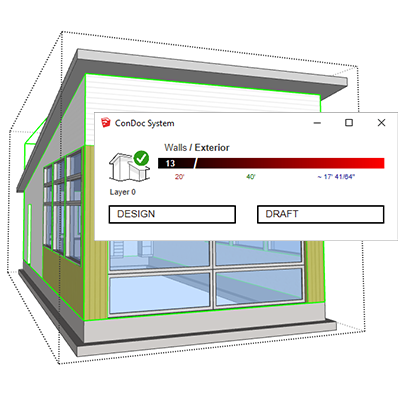 ConDoc is a plugin that expedites construction documents, automates design packets, and drastically improves your project organisation using SketchUp Pro and LayOut. ConDoc is a plugin that expedites construction documents, automates design packets and drastically improves your project organisation using SketchUp Pro and LayOut. ConDoc is designed to provide architects and designers with a seamless workflow process, ease all of the intricate steps involved in document creation and enable you to have complete control in all aspects of your project. 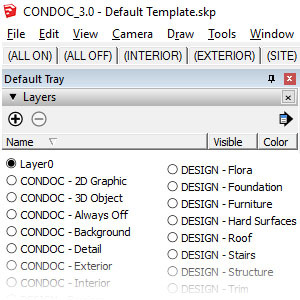 The ConDoc System is a series of templates, layers, and model organisation strategies that provide a clear path for SketchUp success. 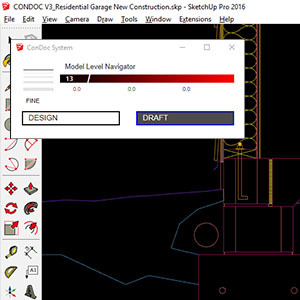 The ConDoc System is built to achieve specific results for designers; expanded arrays of line weights, dynamic hatches, the ability to draft 2D details, communication with consultants, and a way to share work amongst a team. The ConDoc System Extension is a heads-up display that provides real-time feedback to keep the designer informed, on track, and in line with the ConDoc Standards. The Model Level Navigator keeps you informed on where you are at in the model by combining group nesting and layering information into one concise string of text. The Model Complexity Meter will keep you aware of excessive geometry. The new DRAFT mode provides a 2D CAD like drafting platform inside SketchUp! Draft Mode gives access to 2D CAD embedded right in SketchUp! 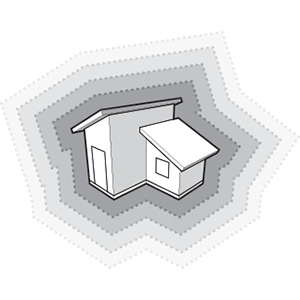 Navigation is limited to 2D panning and zooming, and lines are displayed in a familiar color by line weight style. Who has time to build every detail in 3D? Draft Mode coupled with the Match Properties Tool and the Detail Tool is a fast and efficient 2D CAD replacement. The ConDoc SketchUp Template comes loaded with invaluable utility scenes, snappy layer states, and every layer needed to efficiently organise your model. We spent the last ten years meticulously refining our SketchUp standards, why invent your own? Our Pro tutorials, forum, and manual clearly explain the concepts needed to master ConDoc Tools for SketchUp Pro. This system is predictable, teachable, and repeatable. Your team will thrive on the ConDoc standards that keep your model light and editable. 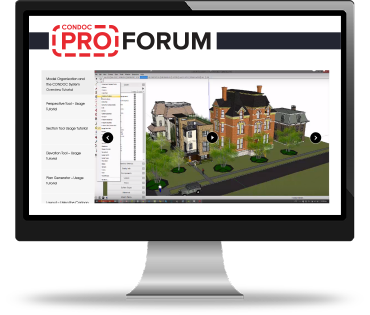 Included in the Pro License is access to our professional tutorial classes, manual, and the Pro Forum where you can learn how to use the ConDoc tools, access exclusive features in SketchUp, and gain helpful workflow tips. All training materials feature Mike Brightman, author of “The SketchUp Workflow for Architecture”. 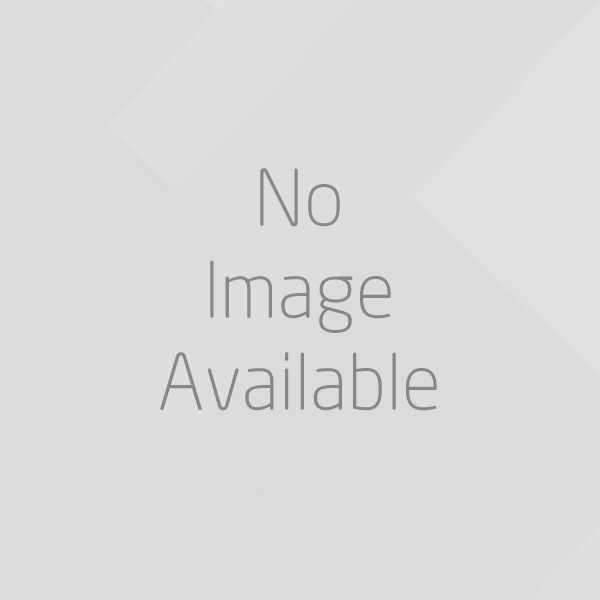 The plan generator is the keystone of the entire ConDoc System. 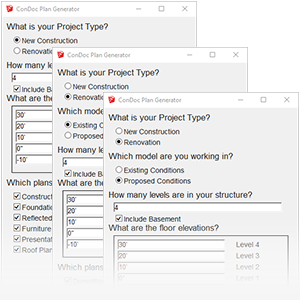 Answer a few questions regarding project type, levels, finished floor heights, and which drawings to include in your set and your project is instantly set up for new construction or renovation.